The conjoined twins at Mulago hospital have pneumonia. The Hospital Spokesperson Enoch Kusaasira says doctors have established that the babies are suffering from pneumonia and have challenges breathing. The babies are however receiving treatment at the intensive care unit. The twins were born in Ngora district and transferred to Mulago hospital for treatment. They first contracted flu and cough, before the condition worsened. Tests conducted earlier by the doctors indicated that each of the babies has their own heart, although they are in the same sack. They also have separate spines. Tests on them have however been halted to allow them recover. Their mother Faith Okiri died during delivery earlier this month. Doctors say the conjoined twins admitted at Mulago Hospital are in stable condition. Tests conducted on the 2 babies indicate that each of them has her own heart though they are in one sack. They also don’t share the spine, according to tests by a team of doctors led by Dr. Jamiru Mugaru. The twins however still weigh 4.46 Kilograms but must gain up to 10 Kilograms before any operation can be undertaken to separate them. These twins were born on 4th of May this year at Ngora hospital and their mother Faith Okiri died during delivery. The doctors say more tests are being undertaken to establish what other organs the children might share. A set of conjoined twins has been admitted at Mulago Hospital. The girls were born at Ngora Hospital in Soroti on 3rd May. According to the team of Doctors, the twins are conjoined at the abdomen. Unfortunately the mother of the twins did not make it through the caesarian birth. The kids that weigh 4.46Kgs are now taken care of by their father Mesial Okirol. Mulago spokesperson Enoch Kusaasira says the doctors are still examining the twins for a comprehensive report on which body parts are shared. Conjoined twins are a rare phenomenon that is estimated to range from 1 in 50,000 births to 1 in 200,000 births, with a somewhat higher incidence in Southwest Asia and Africa. Government must invest in health workers for better service delivery. The call comes as Uganda prepares to join the rest of the world to mark the Nurses and midwives day that falls on the 12th of May. 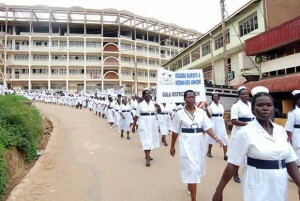 Secretary General Nurses and Midwives union, Topista Kabalisa says there is little to celebrate with the looming health crisis facing Uganda’s health work force and health system as a whole. The celebrations kicked off today with a cleanup exercise at Mulago hospital by Nurses and midwives. Uganda has a nurse:patient ratio of six per 100,000 against the World Health Organisation recommended ratio of 2.5 per 1,000.